In a Pyrex Classic 2L Bowl, add a layer of brownies (or cake). Top with banana slices and drizzle over some salted caramel sauce. Spread a layer of softened ice cream, then add a layer of chocolate sauce. Spread over a layer of whipped cream and repeat the layers again until you reach the top of the bowl. Reserve some brownie, whipped cream, chocolate sauce and salted caramel sauce for the topping. Cover with clingfilm and freeze for 2-3 hours until firm. 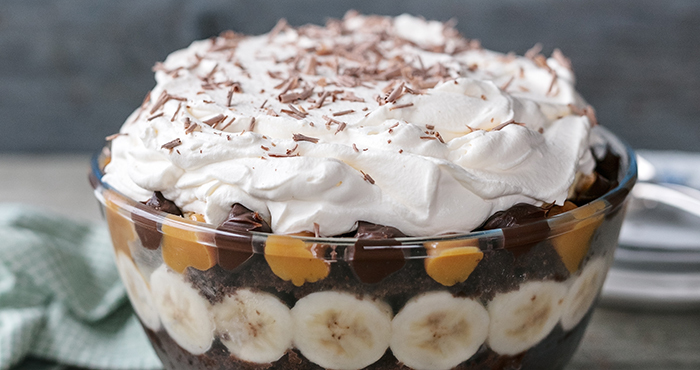 Before serving, let the trifle sit at room temperature for 15 minutes, then top with whipped cream, crumbled browie and a drizzle of the dessert sauces.